“Be green with style” is what defines EventKingdom and what drove founder Patrick von Ribbentrop to start developing EventKingdom in 2006 and offer fine and personal online post to send online invitations, cards, save the dates, announcements and much more. Beauty and convenience seldom go hand in hand. EventKingdom has though managed to combine the convenience of the internet with the beauty of paper. Design and personalization make EventKingdom's online post as personal as paper and thanks to the many helpful tools for senders and recipients also easier than email. Backed by international investors from the USA (FF Angel), Germany (RI Digital Ventures) and Russia (Pylaev, Vinogradov) EventKingdom has a strong position in Europe and is expanding globally, also thanks to great product partnerships with global leaders like Eventbrite. 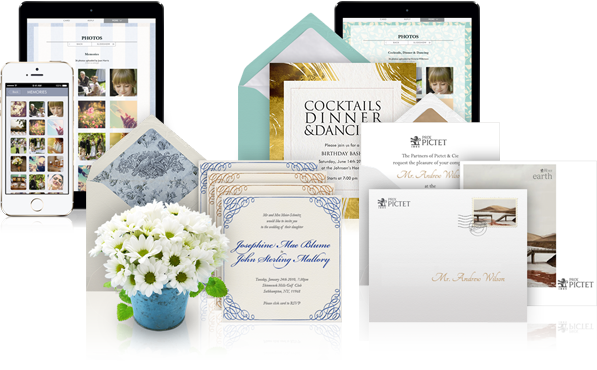 Similar to classic paper, your recipients will not only be thrilled by EventKingdom online post's fantastic style, but also appreciate it and feel special. Your online cards cards will be loved and your online invitations will be more successful and easier to organize, e.g. showing a higher RSVP rate. As of October 2014 in addition to online post you can order the same design as paper cards and give these cards a special personal touch. To emphasize the quality of the service, EventKingdom does not show advertisement, but asks members to purchase stamps to send out their online post. The concept of EventKingdom stamps generates a respected standing in the global internet community leading to white listings on all email providers, making your EK post more secure and efficient. Please see the pricing page to learn more about the cost of using EventKingdom's online post. Paper orders are priced in EUR and are accepted in Europe only at the moment. Registration to EventKingdom is free and you receive 20 stamps, so please do not hesitate to sign up and have a look.